We are at present living in a world which is becoming increasingly global, interconnected, fast-changing complex and unpredictable. To manage such a world, the leader need faculties beyond reason. Here come the importance and relevance of the concept of Raja-Rishi Leadership. To understand this concept of King-Sage, Raja-Rishi, we have to divest it from all ancient images and notions. The word “Raja Rishi “brings the image as an ancient monarch sitting on a throne and the word “Rishi”, the image of a bearded man sitting in meditation. We have to get-rid of these images and understand the terms in its psychological and spiritual significance. The King or Raja represents political power or in general secular power and leadership. The stage or the Rishi represent spiritual knowledge. Can they come together in a single person? There seen to be periods in the history of ancient Indian when there were dynasties of Raja Rishi. An ancient story from Upanishad may throw some luminous hints. An old hermit goes to the prince of the kingdom seeking for spiritual knowledge. The Prince says to the hermit “Until now this knowledge was given only to Kshatriyas. For the first time I am giving it to a brahmin.” So there was a time in ancient Indian when Kshatriyas Kings who ruled kingdoms were Raja-Rishis who possessed spiritual Knowledge. But what is precisely this spiritual knowledge and how it is relevant to contemporary leadership? At its highest, the knowledge of the Rishi has three aspects. First it is a universal or a truly global consciousness which is one with all beings, all the world and all things and in which we can feel all the world and all beings as part of our own self, not as a concept or a feeling, but as on experience, as concretely as feel our body as our own self. Second, this universal consciousness is also our own deepest and inner most truth of all things. Third is has higher faculties which can know things intuitively, which senses and reason can not perceive like for example invisible and hidden realities, patterns and forces behind outer appearance; interrelated and interdependent unity and wholeness of life: immediate and long term consequences of a decision or action for the larger whole of life. In other words a Rishi has a deeper, wider and better knowledge of people, life and the world than a worldly man who lives in the small and narrow surfaces of his being. Is this not the type of knowledge required at present for a leader for managing a globalized world? This highest knowledge of the Rishi can be realized only by a few. But an intuitive reflection of it can be attained at the mental level by opening our mind to the spiritual consciousness through a process of Yogic discipline like mental silence and purification. The other important characteristics of the Raja Rishi is to live from within outwards. The Raja Rishi lives not in the surface being like most of us but lives in his inner being or deeper self in a state of undisturbed peace, equanimity and detachment and acts from this settled inner poise. This makes him a better leader and decision-maker because this inner poise gives a depth and clarity to his thinking which someone lives in the turmoil of his surface being cannot have. The poise of peace and equanimity helps him to remain undisturbed midst the turmoil and vicissitudes of life and the world around him and inner detachment gives him the ability to judge things objectively and impersonally without the interference of personal desires and preference. 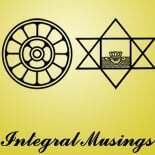 This entry was posted on August 17, 2018 by integralmusings in Integral Management.